Thanksgiving is the perfect day of the year to gather with family and express gratitude for all of the blessings in our lives. 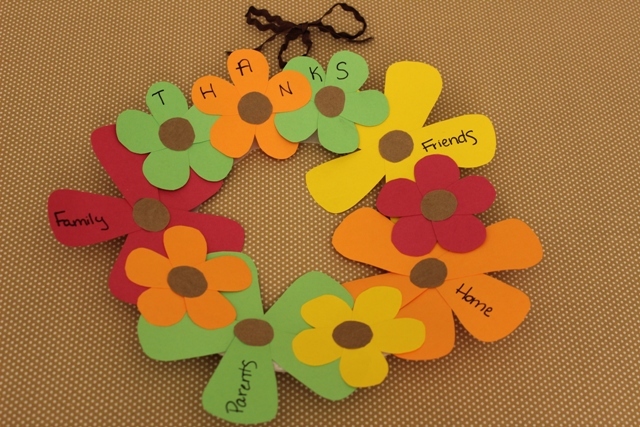 Spend time with your kids and show them what the holiday is all about by helping them create these beautiful Thanksgiving flower wreaths. You can make them in a few simple steps, and cleanup is a snap … giving you more time to create memories that you and your kids will cherish for many Thanksgivings to come! Cut out multiple flowers from construction paper. On each flower, write something you are thankful for. You can use the shapes shown above as a guide. Cut out a large hole in the center of a paper plate to create a wreath shape. Glue the flowers around the entire wreath. Punch a hole at the top of the wreath and loop a festive ribbon through it, as shown above. Then, hang up the wreath for all to see! Here’s another fun Thanksgiving craft idea: Create these adorable turkey sunflowers with your kids for a gobbling good Thanksgiving!